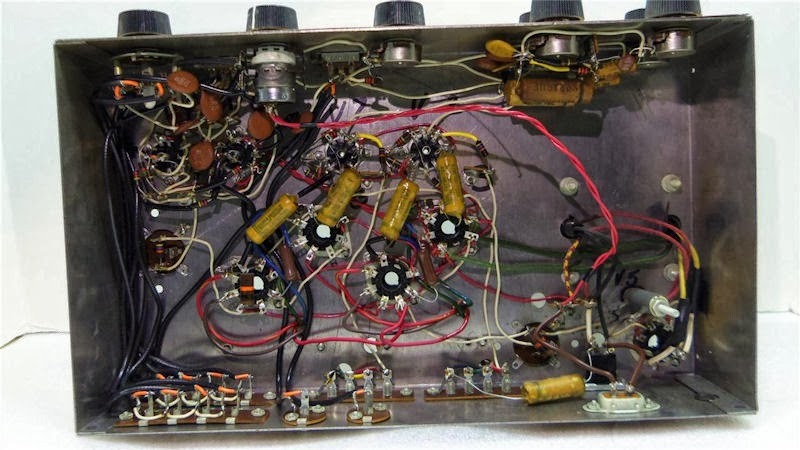 I was interested in building a small single ended amplifier, and found several that had been sold in the 60's. They went for quite a bit on ebay and I figured I would build one. 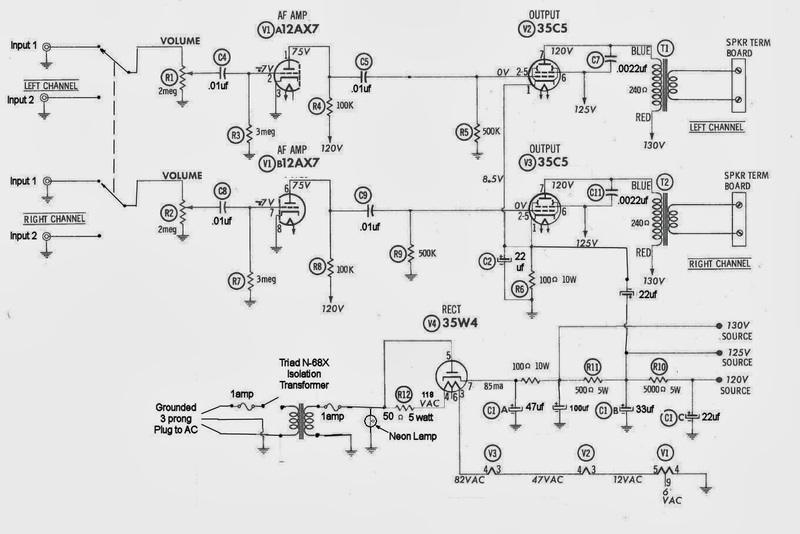 I found this in an online copy of a Radio Shack Catalog. I had found a stainless steel drawer at Goodwill. I had to order a couple of Edcor XSE15-8-2.5K audio output transformers, which took 6 weeks to ship. 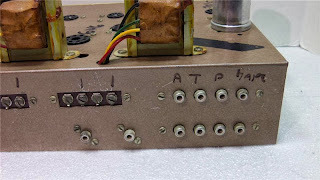 I had most of the other parts and only had to order some POT's and 3 meg resistors. 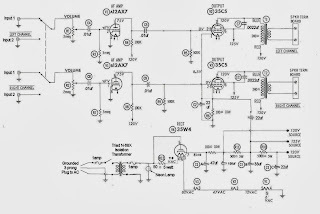 I designed the Layout of the amp in Autocad 2002. I then printed the drawings at 1:1 and taped them to the drawer. Center punched and drilled the holes. Attached all the hardware, switches and pots. Then soldered in all the components. There was some problems with hum and it took a couple of days to troubleshoot with help from an Antique Radio Forum.This is the original Schematic. Here is the Final Schematic. 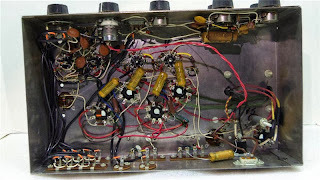 These are the pics of the finished amp. It still needs labels and better knobs. Added Isolation power Transformer to prevent accidental electrocution. 3 prong plug grounded to chassis. Fuses on input and output side of power transformer. 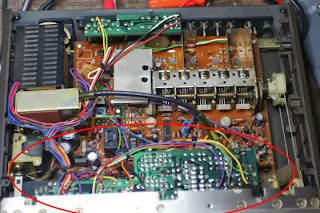 Used shielded cable for all the input wiring up to the 12ax7. Added a 100uf Capacitor after first filter to reduce ripple by half. Added a 22uf capacitor off of 125v source to pin 1 of both 35c5's to cancel out hum. 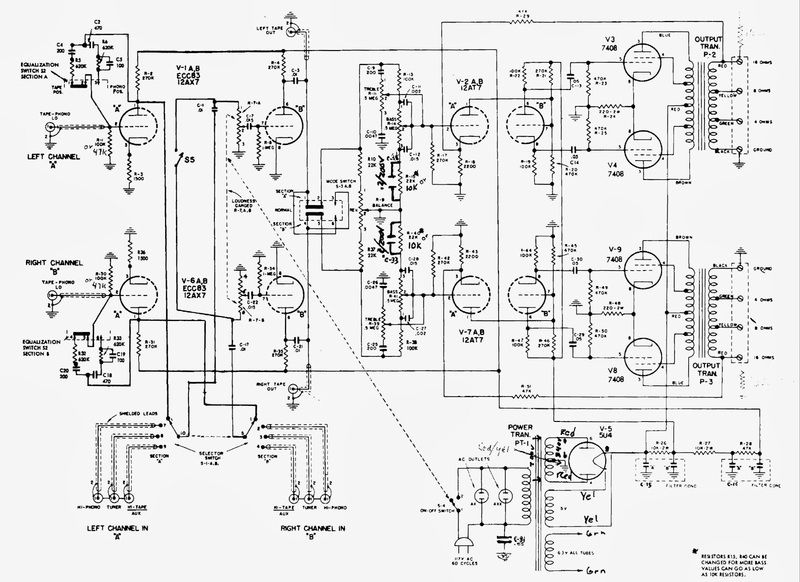 Hum is now down to 20 millivolts and can only be heard with your ears about 6 inches from the speakers. 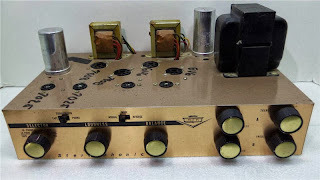 This is a 1.5 watt per channel max, single ended tube amplifier. 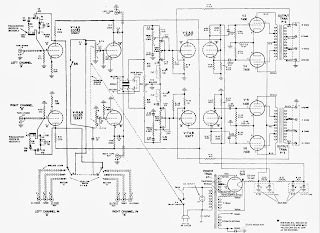 It will drive most any speakers just fine, frequency response is approximately 70 to 17000hz Not Hi-Fi, but 99% of the population can't tell. It will not do much in the way of deep bass, but bass is over-rated anyways. Picked this up at hamfest Saturday for $15. it does not have the probe and I will be making one. I did a simple recap on it, which reduced the noise levels on the (non noise setting). I replaced the cord, mic connector, and added a fuse. I removed the nasty stained speaker grill and replaced it with some black speaker cloth and a box fan guard. I then gave it a lite bath. The 6E5 Eye tube seems a little dim and I will look for a replacement at some point.